This blog post will take us to a continent which is not usually our investment ground. It’s a look on possibly one of the most profitable companies emerging in Africa. It is called ‘Dangote’ and founded by Alhaji Aliko Dangote, a Nigerian entrepreneur who, after studying Economics in Cairo, started importing rice, sugar and cement. 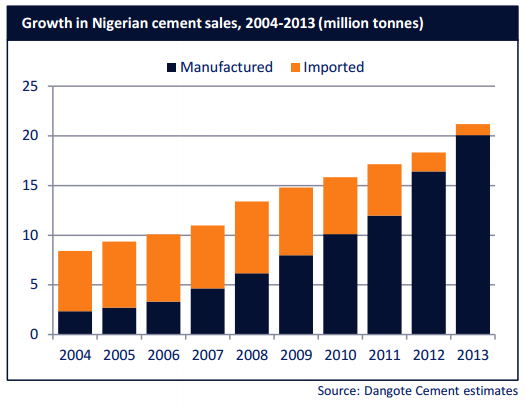 Dangote is now the biggest cement manufacturer in Africa, but does also diversify into refining of salt, milling of flour, manufacturing of pasta, noodles and poly products, logistics and real estate. Since its establishment the company has grown rapidly by providing basic goods to the populace, a mission the management is particularly proud of. 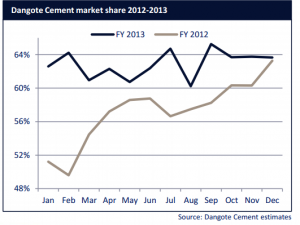 We will focus on the Dangote Cement. First off, I will give you the financial highlights, values are in billion Nigerian Naira. 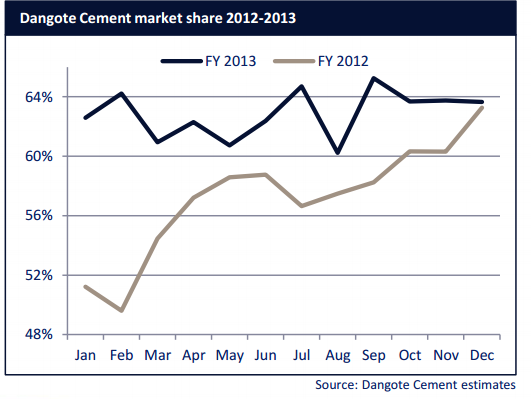 Recent reports: http://dangote.com/downloads/Dangote-Cement-Q1-2014-results.pdf, http://dangote.com/downloads/Dangote-Cement-2013-Presentation.pdf The first annotation that needs to be made is that inflation in Nigeria is momentarily 7.9 percent, down from 8.5 in 2012. While it has an average GDP growth of 6.7 percent, (developing) Sub-Saharan Africa is at about 4.3 percent growth per year in average. Still this company outruns the economy and inflation significantly. That is due to several reasons. The Nigerian gross domestic product is supposed to grow by 6.9% until 2016, but the high demand in construction will push demand for cement at a double digit growth rate, according to the IMF. In the Q1 2014 it becomes obvious that there have been gas infrastructure problems that will affect the supply and momentarily drive down the EBIT margin. The efficiency with which the company is able to operate is still stunning in our eyes. Well, how does the stock look? Right away, we need to say that this company does not look like an investment for our purposes, in terms of risk aversion and sustainability. That being said, let’s put on our analytical glasses and look at the stock. 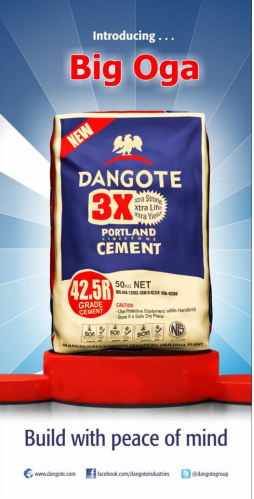 Dangote Cement (DANGCEM:NL) is traded in Lagos at a price of 229.50 NGN currently. The market capitalization is 4,004,519.51 million (!) NGN, equal to 18.14 bio EUR at the current exchange rate. So the price/book ratio is at 7.18 right now. EV/EBITDA is 17.97. This is usually where a value investor might stop already, but our reason to do so is not this number. At this point we would normally create a DCF model with different input methods to evaluate the long term enterprise value, but we struggle with the political and economic uncertainty in Nigeria and Sub-Saharan Africa. At the end of the day, the estimated growth rate separates good businesses from mediocre ones in the outcome of the DCF model. Anyway, the current share price would be reached with assumptions for a mini-DCF like this: 17% growth in the next five years, followed by the average Nigerian 7% after that period. 15% discount rate should resemble the cost of capital including inflation as mentioned above. We think that these estimates are not quite unrealistic. Have we learned something out of this? We admit to have looked at this company by recommendation of a friend, not by looking for low P/B or other typical value search methods. In fact, we have seldom seen a company close to this enormous efficiency, powered, of course, by tax exemptions, an oligopolistic market and strong growth trends. It is supposed to be a small excursus into a very exciting and highly profitable business. It was also interesting to read a quite different type of annual report. We do recommend reading the Chairman’s letters in respect to how he approaches local authorities, something you will not usually find in a clean European or American business. Of course, our next posts will contain more classical value investing items, but if you liked this short introduction or would like to recommend another (foreign/exotic) company that is worth taking a look at, just leave a comment, as always.